A United Launch Alliance Atlas V rocket carrying NASA's OSIRIS-REx mission launches into space from Cape Canaveral Air Force Station, Florida on Sept. 8, 2016. 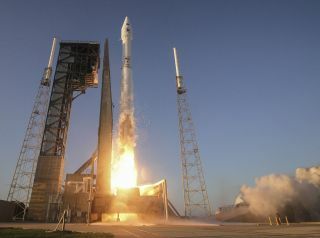 CAPE CANAVERAL, Fla. — NASA's bold mission to bring pieces of an asteroid down to Earth has taken flight. The agency's OSIRIS-REx spacecraft lifted off from Cape Canaveral Air Force Station here today (Sept. 8) at 7:05 p.m. EDT (2305 GMT), riding a United Launch Alliance Atlas V rocket into an evening sky suffused with golden light. "Liftoff for OSIRIS-Rex, its seven-year mission to boldly go to the asteroid Bennu and back," NASA spokesman Mike Curie said during a live launch broadcast in an apparent nod to "Star Trek," which celebrated its 50th anniversary on Thursday. "Sample return is really at the forefront of planetary exploration," OSIRIS-REx principal investigator Dante Lauretta said during a prelaunch news conference Tuesday (Sept. 6). "Not only are we going to get this material into our laboratories for precise chemical analyses that can't be duplicated by spacecraft instruments, but this is [also] going to be a treasure trove of information and material for scientists yet to come." The launch drew some special guests — former TV "Science Guy" Bill Nye, who currently serves as CEO of the nonprofit Planetary Society, showed up at NASA's nearby Kennedy Space Center (KSC) with 12-year-old Mike Puzio. Three years ago, Puzio won the Planetary Society-run contest to rename OSIRIS-REx's asteroid target, which had been known as 1999 RQ36. "We're really excited about this mission," Nye told reporters at KSC. "This will advance our knowledge of the solar system's beginning." "We're going to asteroid Bennu because it's a time capsule from the earliest stages of solar system formation, back when our planetary system was spread across as dust grains in a swirling cloud around our growing protostar," Lauretta said. Furthermore, scientists suspect that Bennu and asteroids like it harbor a variety of organic compounds, the carbon-containing building blocks of life as we know it. Indeed, researchers think such space rocks may have played a key role in the rise of life on Earth, by delivering organics and large amounts of water to the planet long ago. This idea will get a test when OSIRIS-REx's sample comes down to Earth, allowing researchers to determine exactly what lies on, and just beneath, Bennu's surface. "The information we're going to gain from OSIRIS-REx, it's really going to help pull back the curtains on the origin of this planet, on the origin of life itself," NASA Chief Scientist Ellen Stofan said during a panel discussion here Wednesday (Sept. 7). NASA is sending a probe to the asteroid Bennu to collect samples from the space rock and return them to Earth. See how NASA's OSIRIS-REx mission to collect samples of the asteroid 1999 RQ36 will happen in this Space.com infographic. In August 2018, OSIRIS-REx will meet up with Bennu, which currently lies about 140 million miles (225 million kilometers) from Earth. The solar-powered spacecraft will then study Bennu from orbit for nearly two years using five different science instruments. This work will allow mission team members to choose the best possible spot from which to grab samples. Then, in July 2020, OSIRIS-REx will slowly descend toward Bennu's surface. But the minivan-size spacecraft won't land; at close range, OSIRIS-REx will deploy its Touch-And-Go Sample Acquisition Mechanism (TAGSAM), a disk-shaped sampling head at the end of an 11-foot-long (3.4 m) robotic arm. TAGSAM will contact Bennu for 3 seconds. During this time, the probe will use nitrogen gas to blast the asteroid's surface, stirring up dust and pebbles that will then be trapped within TAGSAM's sampling head. The goal is to obtain at least 2 ounces (60 grams) of material, mission team members have said. The OSIRIS-REx team will give 4 percent of the Bennu sample to the Canadian Space Agency, while the Japan Aerospace Exploration Agency (JAXA) will get 0.5 percent. The vast majority — 75 percent — will be set aside for future researchers, mission team members have said. OSIRIS-REx is NASA's first asteroid-sampling effort, but not the first such mission in history. JAXA's Hayabusa mission succeeded in bringing tiny grains of the asteroid Itokawa to Earth in 2010. And JAXA's Hayabusa 2 probe launched in December 2014 to sample another space rock, named Ryugu. NASA has returned material from other types of bodies, however. Stardust sampled a comet, for example, and the Genesis probe brought home pieces of the solar wind in 2004. Most famously, astronauts lugged more than 800 lbs. (360 kilograms) of lunar rocks and dirt home during the Apollo missions in the late 1960s and early 1970s. OSIRIS-REx also has some secondary science objectives, as the mission's lengthy name suggests. For example, the spacecraft will make detailed measurements of the Yarkovsky effect, which describes how the solar energy that asteroids radiate away as heat can change the objects' trajectories. Since Bennu's discovery in 1999, this "heat thruster" action has shifted the space rock's position in space by more than 100 miles (160 km), Lauretta said. And it's important to know exactly where Bennu is headed, he added, because there's a slight chance the asteroid could hit Earth late in the 22nd century. "We really want to understand this phenomenon so that we can better understand asteroid Bennu and apply that understanding to all asteroids, not only in near-Earth space but throughout our solar system," Lauretta said in Tuesday's news conference. OSIRIS-REx's mapping work could also shed light on the resources Bennu and similar space rocks harbor, information that would presumably be of interest to asteroid-mining companies, mission team members have said. "We've got great science ahead of us," said Lauretta, who's been working on the mission since 2004. "I'm really excited to get to this milestone, to get OSIRIS-REx launched on its journey to Bennu and back."